As is evident from this blog, we tend to avoid the main tourist beaches when we go out, We prefer to explore the island and try restaurants that are more local. There are loads of seafood places around the coast where you don't see many tourists. 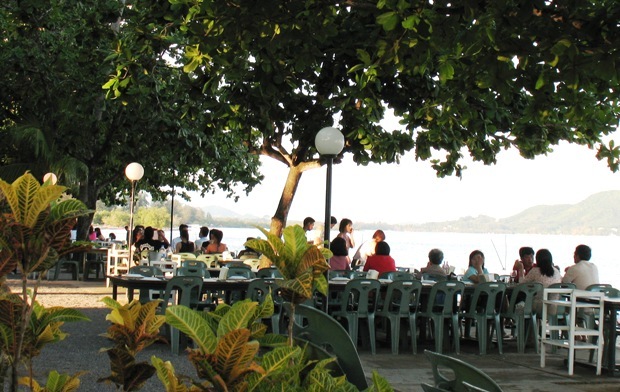 Some of our favourites are Bang Pae Seafood, Laem Hin Seafood - and there are many more. Kan Eang 2 Seafood is found on Chalong Bay, just a few hundred meters from Chalong Jetty, and was right next door to Danang Seafood. Quite why we have never eaten here before is a mystery, I guess because we like Danang and were always happy to eat there. Kan Eang always looks busier and sometimes has buses full of people arriving. Is this because the food is better or because they have better marketing than their neighbour? I think the buses put us off before, since Danang is normally pretty quiet and the food has always been good there - and as I get older I become less adventurous! Note - Danang closed down in about 2009. Kan Eang 2 is still there. There is also a newer, fancier place called Kan Eang @ Pier, right next to Chalong Pier. Well, we ate at Kan Eang Seafood on 14th April and couldn't have picked a much busier day, since the 14th is during the Songkran holidays! The place was full, all tables were occupied or reserved, but they found us a spare table nonetheless. Service was good, though a bit slow - can't blame them and we will try again on a quieter day. The Yam Kai Pla (fish roe salad) was very good. Like most of the seafood restaurants, you sit right by the water. The view over Chalong Bay is great. We like this kind of restaurant. It's quiet, they don't play music, you can't hear any cars, the food is a decent price. 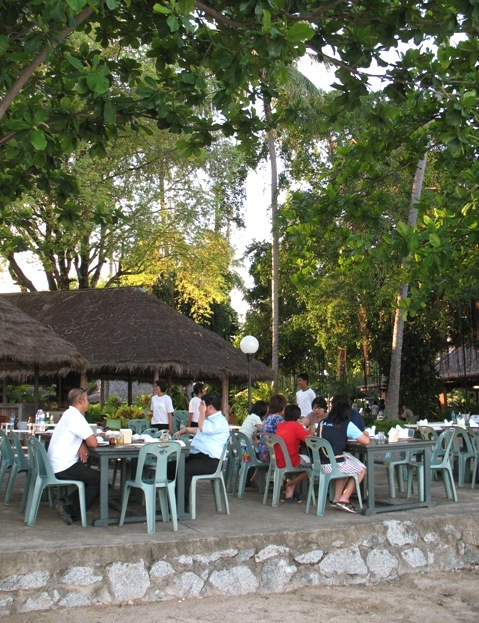 If you are staying on one of the main beaches, try to get out for a nice evening meal away from the hustle and bustle. Chalong is only 10-15 minutes from Kata, or about 25-30 minutes from Patong. Note - this is an older blog post from 2007. Kan Eang is still there but has been tarted up a bit with prices also increasing. There is also a fancier and more expensive "Kan Eang @ Pier" right next to Chalong Pier. We have only ever had drinks there. 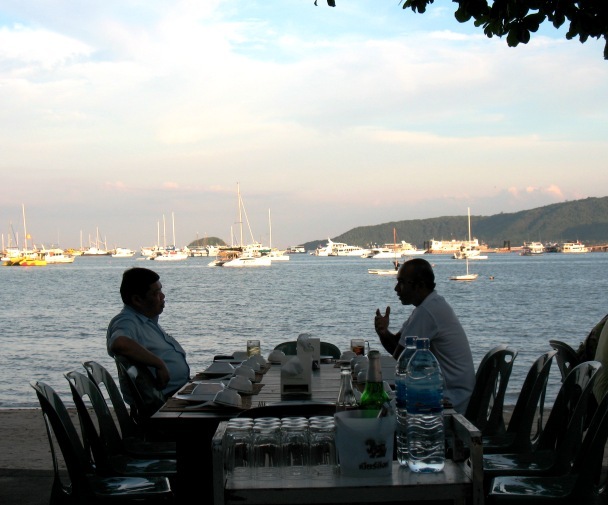 For more restaurants that we recommend, and which are mostly a very good price .. see Phuket Restaurants.